Soniah Kamal - Barfi: Can Everyone Live a Full Life? Barfi: Can Everyone Live a Full Life? 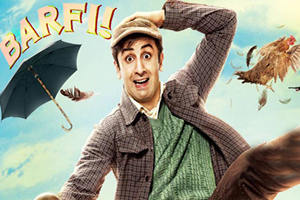 Barfi begins with Ranbir Kapoor, the eponymous Barfi, aged-by-makeup so much so that he actually looked a bit ridiculous. The first half hour was slow. In fact beginning the movie with Barfi in old age sort of killed all the suspense for me: I mean no matter how bad it gets obviously this character makes it to a very ripe old age. The movie then goes into two flashbacks, one inside the other, carrying the further risk of boring an impatient film goer; Barfi really only picks up after the intermission. But to my surprise I found myself wooed long before the intermission by the gorgeous cinematography of a 1970’s Darjeeling, West Bengal which reminded me so much of yesteryear hill stations where an idyllic life was full of slow lazy happy days. I was also wooed by the deaf and mute Barfi’s sweet Chaplinesque antics no matter how unbelievable, as well as everyone’s fine acting especially Priyanka Chopra who is barely recognizable as ‘herself’ without the glamour girl hair and makeup and tight outfits. Priyanka plays Jhilmil Chatterjee an autistic girl, though in my estimation her acting seems to fit the profile of someone mildly retarded rather than autistic, that said Priyanka’s understated acting is a delight to watch. I came to care deeply for Jhilmil in her weird girl-woman attire, her bursts of delight, her averted gaze, her confidence to negotiate life as much as she can on her own terms. Barfi is a lovely film about everyone possessing the ability to lead fulfilling lives no matter what they are up against. The movie’s central conflict is a love triangle but refreshingly enough it is also a movie in which ‘real’ love is not necessarily your first love or even the most predictable. Barfi also brings up the age old issue of love versus money, as well as the choices one makes and subsequent regret. Is there always regret no matter what path one chooses? Had Shruti chosen another way would she truly have been happy? Barfi is full of beautiful little touches: Barfi’s shoe as signal, Barfi intertwining Jhilmil’s pinkies, Barfi with a rough, ‘no’, one of the few time Barfi speaks, ripping Jhilmil’s bag away from Shruti. Pritam’s score is excellent however I think the viewer could have done with many more moments of absolute silence in order to understand Barfi’s inner world i.e. that he cannot hear a thing. I left the movie theater glad I’d watched Barfi but not particularly enamored. Two days later, do I wish the movie moved a lot faster in the beginning, absolutely, but the fact that I’m still thinking about it makes me realize that I am smitten. Barfi is India’s selection for the 2013 Oscars; though not a perfect film it is very good for an Indian film and I hope it makes the cut. I completely agree with Lakshmi Chowdary over why Barfi’s Oscar chances are rather slim. It is not exactly your hard hitting, original, social film. But it’s not just that. Barfi is a cute film, that is it’s always easier for an audience to digest disability framed within humor and Barfi’s editing could have been much tighter. It is interesting to me to see how so many of us qualify statements with ‘well for an Indian film, it’s really good‘, implying that were it pitted against ‘other’ films it would not be so good. I enjoyed Barfi perhaps but partly my enjoyment stems from the history I have with Indian films. A child of the 70s, 80s, 90s, Indian cinema grew me up. While some kids clutch teddy-bears, I look back fondly on Jumping Jack and Shrill Sridevi, Govinda and Kader Khan making banana jokes, Kumar Gaurav in Love Story, Neelam’s hair, and Amrita Singh out-brawning a rather scrawny Anil Kapoor in Chameli kee Shaadi. (let me quit my Indian movie memory lane because it’s never ending). So to see Rishi and Neetu’s son, Ranbir up on screen doing a great job, is like visiting a fantasy family. Was Barfi from some other country and was I watching it with subtitles, I wonder if it would be memorable?